The blog has been rather quiet recently as I have run into continuing joint problems and am now seeing a shoulder surgeon in addition to a knee surgeon! I gave up mountaineering when my knees packed in now I am worried about sea kayaking as my shoulder problems worsen. 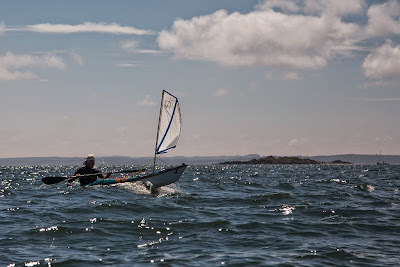 I have not been on any expeditions since early March and unfortunately I had to pull out of the Skye Sea Kayak Symposium (at which I was going to demonstrate kayak sailing). 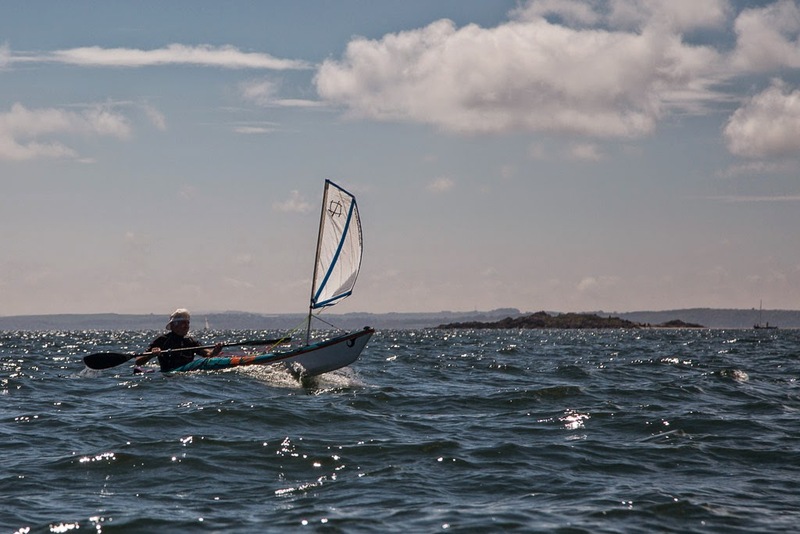 This was a great pity as it was the first Skye or Jersey sea kayak symposium that I have missed in many years. I hope everyone is having a really good time at the symposium. Yesterday Phil and Andrew wondered if I would like to join them on a trip to Ailsa Craig. Unfortunately I had to decline this too as I could not get my sea kayak onto the car roof (even with the Karitek easy load roof rack). Nor could I drive that distance and I certainly could not guarantee that my shoulder would last the 34km round trip. Instead I thought I would review some of the recent testing of the P&H Aries 155. ...ability to enjoy continuous planing over considerable distances. 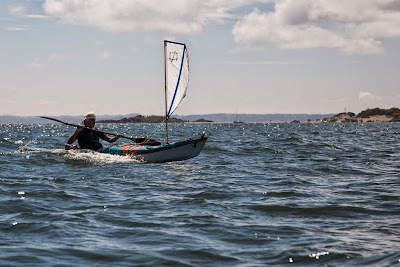 Many people stop paddling (and trail their paddle in an extended low brace) when there is enough wind for the sail to drive a kayak at its displacement speed. However, as can be seen here ,kayaks like the Aries and Delphin will rise onto the plane, then considerably exceed their theoretical maximum displacement speed. 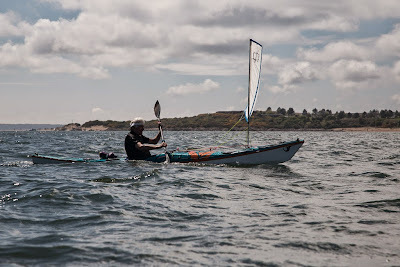 Therefore not only should you continue paddling but in marginal planing conditions you should paddle as hard as you can to pop the kayak up onto the plane and keep it there. In stronger winds you will also find that travelling fast downwind reduces the apparent wind on the sail and this paradoxically means travelling fast makes it easier to survive and enjoy difficult conditions. Here David has overtaken the wave in front and has climbed up the wave back. He has reached the critical point, where his body has nearly crossed the crest of the wave but the kayak has dropped off the plane. At this point the apparent wind in the sail increases as the boat slows. 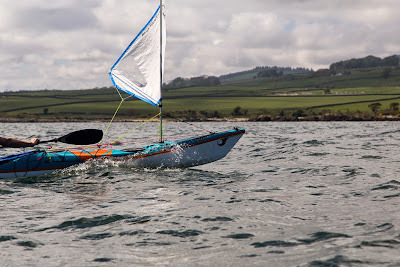 This increases the drive in the sail but is also the time you need to paddle as hard as possible. If I had been David, I would also have leaned forward as far as I could (but as David has a bad back and in a few months will enter his eighth decade, he has a partial excuse). Two stiff strokes sees David break through the crest of the wave in front and start planing again. Yee Haa! Although, in my previous posts on the Aries 155, I have said it is a wonderful kayak to paddle with a Greenland paddle, I would not recommend a GP when trying to drive a kayak onto the plane in marginal conditions like these as you simply don't get the same explosive power. Here David is using a wing paddle. 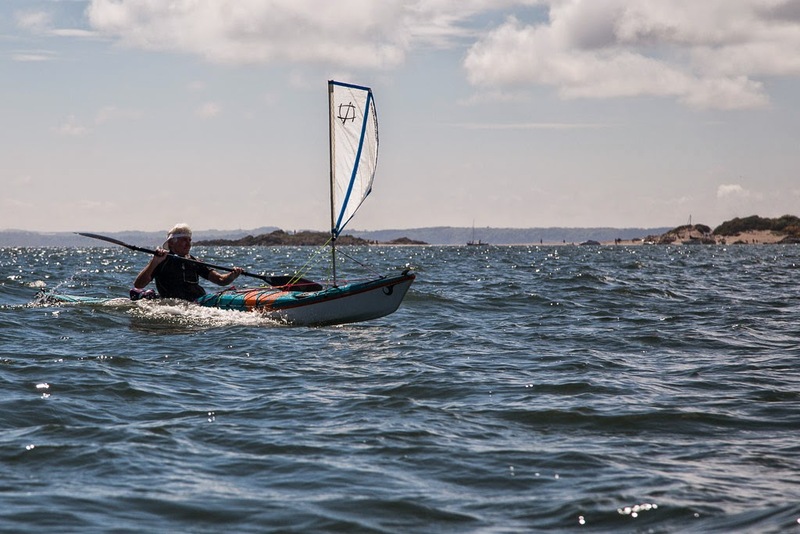 One of the beauties of the Flat Earth kayak sail is that it allows you to continue to paddle with no hindrance when the sail is hoisted. 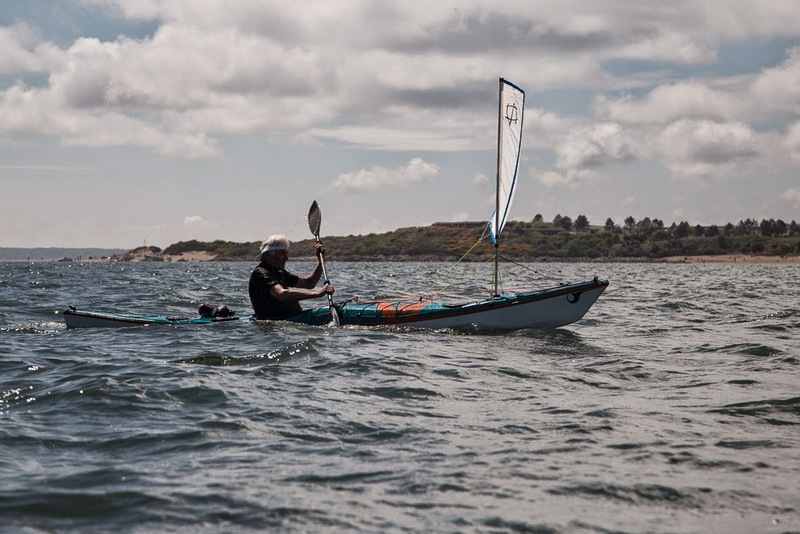 Don't expect paddle sailing to be a relaxing easy option. Paddle sailing a kayak is hard work. The idea is to maximise planing time as this is such fun.